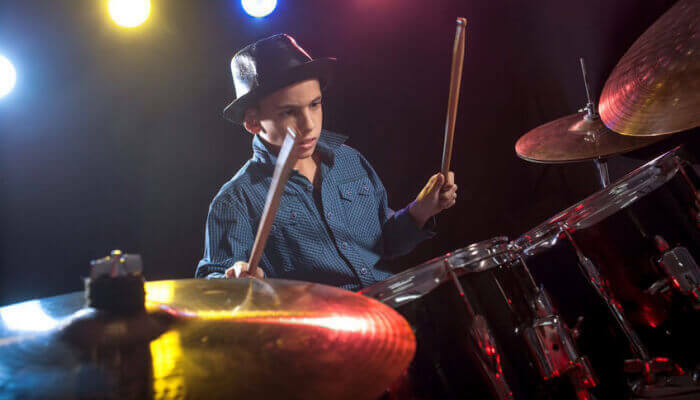 In this article we’ll take a close look at some of the best beginner drum sets available for kids and adult starters. But before we dive into the detailed beginner drum set reviews, here’s a few facts that will motivate you even more. Drumming is an art that so many have worked toward perfection in their lives; however, do not fret if you have never played the drums. Remember that all the great drummers through the years were once beginners. Does that give you a little light at the end of the tunnel? Drummers like Neil Peart, Dave Grohl, Keith Moon, Stewart Copeland, Ringo Starr, and many others were inexperienced at one time, too. Neil Peart, for example, is considered the best drummer of his generation. He not only kept the rhythm for the band “Rush,” but he was also creative in his playing style, even though he also focused on writing the lyrics for many of the band’s songs. It is never too late to learn for the first time and get the best beginner drum set around. Take Maureen Tucker, from the band “Velvet Underground.” She was 19-years-old when she started playing, and went on to become not only one of the best female drummers of all-time, but one of the best drummers in the history of the world. Why should all this matter to you? Sure, you may have come for a review of some of the best drum sets on the planet, but immolating and learning from others will create your personal style. Then, by having the right drum set, this will allow your creativity to take flight. With so many beginner drum set reviews on the Internet, in magazines, and in book form these days, it is hard to sort through all the noise. Knowing how to buy a drum set for beginner level players is not easy. 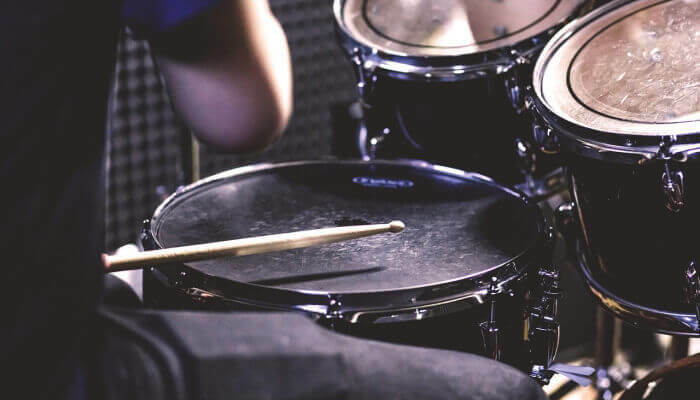 There are so many questions to ponder, so many drum sets to try out, and there are a variety of experiences that people have had positively and negatively with a mass amount of drum sets. One person might be elated with the drum set they own, but another may have the same brand with a horrible experience. Still, know that it is rewarding when you figure it all out. This is when the lightbulb starts to come on, and you just want to get to play the set you know is the one for you. However, if you are looking more for review-based descriptions, this is the place to be. Before we get neck deep in the detailed reviews, check out these 3 beginner drum sets that you should consider buying for yourself. Now that we have gotten into some of the highlights, let’s discuss some of the particulars to consider when purchasing the best beginner drum set. You should not go into the drumming market without a few things in mind. Briefly, let us talk about a few thoughts you should be pondering when buying a quality beginner drum set. First, you should decide if you need a junior drum set or a full set. Depending on your height, or depending on if you want to grow into your set or not, a full-size set might be the best option for you. 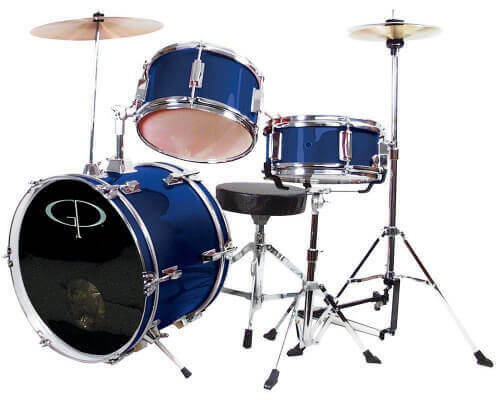 However, most children work with a junior drum set to help give them a stepping stone up to the full-size set. Junior drum sets usually are 3-piece, but they can be 5-piece as well. Full-size sets usually have a 5-piece minimum. Price should be the next question to ponder. 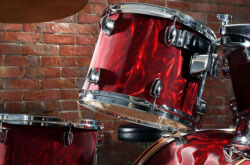 Drum sets can range from a few hundred dollars all the way into the thousands. You will have to budget out what you think you can afford and stick to the plan. Nothing is worse than having a budget and going over it, leaving you in a world of hurt. But, understand you can always upgrade down the road. Next, you will need to determine what you need with your drum set purchase. Many junior drum sets do not come with a hi-hat to play on. Also, small trap sets are limited to only one cymbal more often than not. 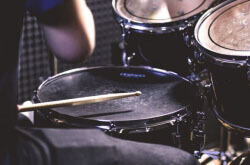 To learn properly, many teachers ask for their students to have these added pieces to garner the full experience of playing on a drum set, while other appreciate simplicity. So, if you plan to teach yourself or have a teacher along for the ride, make sure the education revolves around you and your needs. Drum sticks are also an important thing to remember when buying your personal drum set. Some people think they can buy any old drum set, but this is not true. Drum sets really do have their own personalities. Some sets have included drum sticks with the purchase, but many kits come without sticks. If you need to buy a few pairs of sticks, purchase a few with varying weights and see what works best for you. So, what is the best beginner drum set? Let’s figure this out together. That way, you will be able to pick the best entry level drum set. This GP Percussion set is one of the best junior drum set options around. It comes in variety of colors like wine red, metallic purple, metallic green, metallic royal blue, metallic pink, silver, metallic red, black, and blue. The great thing about this trap is the fact that all hardware and stands are included with your purchase. Nothing is left out for you. This drum set includes a bass drum, snare, tom, crash cymbal, hi-hats, bass drum pedal, throne, drum key, and drumsticks. After assembling these drums, this set is ready to rock. Some customer reviews have been impressed with the quick building process, and this has outnumbered the people who have had issues over time. Lastly, the make-up of this drum set is adjustable for the stands and the stool, too. The verdict with this kit is that it is perfect for children beginners, but it would not be recommended for beginner adult players at this point, due to its small size. As cheap drum sets for beginners go, the GP Percussion GP50 3-piece set is great for the little ones. Beginner drum set reviews love this Gammon Percussion trap. Gammon has made a name for itself by creating product support for all their models, and providing value and performance that match-up with one another. Pretty great standards, don’t you think? This set includes a bass drum, a snare, 3 toms, a hi-hat, and a ride cymbal. 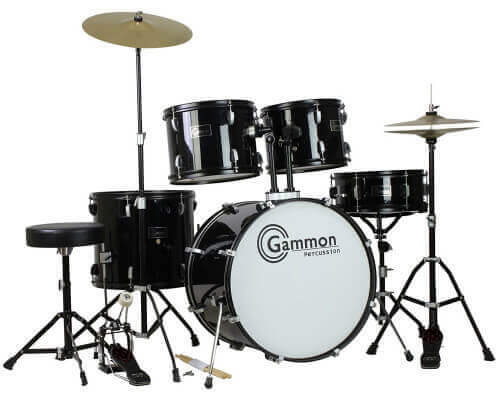 The Gammon drum set is perfect for an older child, teen, and even an adult. A lot of people have purchased this set over the years because of its inexpensive price and the name that Gammon has made for itself. Also, there are a few color options of black, blue, wine red, and metallic green to choose from. 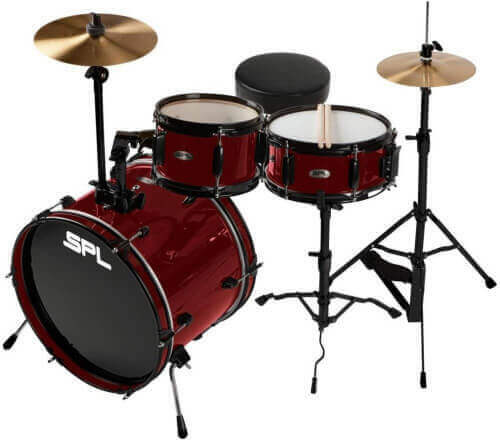 On Amazon, it is one of the best-selling drum sets that the site offers. Many drum set recommendations definitely have the Gammon Percussion Drum Set on the list. With fast shipping, you will be able to receive this drum set in no time. The verdict is out for the Gammon Percussion Full Size Complete Adult 5-Piece Drum Set, and the results are favorable. For a beginner, this full kit has value not just for children, but up to adults to enjoy, as well. Some beginners do not actually get a full, complete set when they get started. 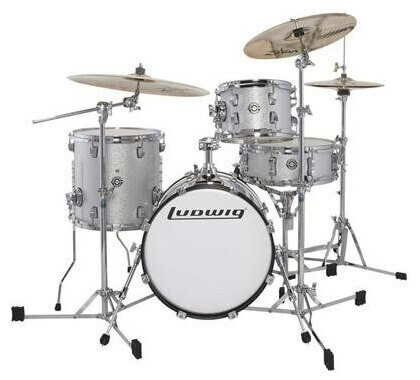 That is where the Ludwig Breakbeats 4-Piece Shell Pack comes into view crystal clear. Think of this drum set like a guitarist buying a new guitar. They will purchase the guitar, but they will not worry about the pedals right away. This is the same way of thinking with this good starter drum kit. The Ludwig Breakbeats Shell Pack is ideal for small settings with limited space. With this set, it includes a 16-inch bass drum, two toms, and a snare drum. However, remember there are no cymbals or hi-hat included with your purchase of this set. Still, there is a mounting spot available when you are ready to get the perfect cymbals for you and your drumming style. Tone and quality for this set is impeccable, and it comes in nice color options like Azure Blue, White Sparkle, and Black Sparkle. For the size, quality, and sound of the Ludwig Breakbeats 4-Piece Shell Pack, the verdict for this set is prime. If you only have a limited amount of money, this Ludwig set is magnificent when focusing on drums for beginners’ age 12-years-old and up. One of the best drum sets for kids is here for you to investigate. At first glance, the 3-Piece Sound Percussion Labs Lil Kicker has the look of a stylish drum set. The color stands out to anyone who comes across it, but is it the best drum set for beginners? Does it play as good as it looks? It is definitely up there because of its quality, price tag, and added equipment to make you feel like you got a sweet deal for this drum set. This multi-ply drum set, made of wooden shells, includes a 16-inch bass, an 8-inch tom, and a 10-inch snare. There is also a cymbal stand that is built into the bass drum, and it is adjustable for whatever height you need. Color options are at your disposal, and it includes red, wine red, or black and white. Many people give the 3-Piece Sound Percussion Labs Lil Kicker a try because, even as a small trap, it includes a hi-hat. This becomes the difference for a lot of people who are beginners and on the smaller side. Since the quality and sound for this drum set is astounding, this is the best drum kit for a 10-year-old child specifically. 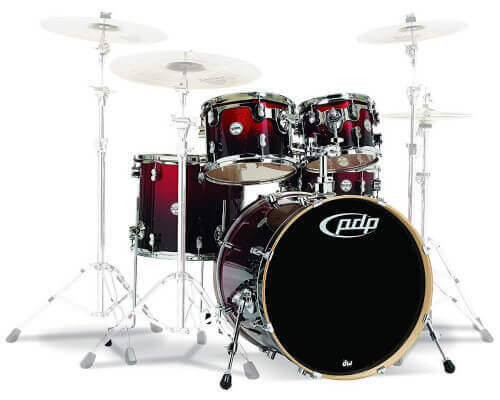 Of course, most beginners have no idea the different brand options, like this next one: the PDP CENTERstage 5-Piece Drum Set; but, many common drummers probably have not heard of the brand either. PDP is newer to the market, but they are turning heads with the product they are presenting to the public. DW is another top drum brand joined, with the likes of Pearl, Ludwig, etc. and they own PDP (Pacific Drums & Percussion). A lot of the techniques that DW uses with their drum sets have been crossed over with PDP as well. This 5-piece drum set includes a 22-inch bass drum, a 14-inch snare, and 3 toms. A hi-hat and one cymbal are include, too. As one of the best starter drum kit selections, upgrades are possible and the birch shells provide a great punch with every strike of the drum. Sapphire, onyx, diamond, and ruby are the color varieties. The best drum set brands for beginners not only have great quality, but also a sensational sound to boot. The PDP CENTERstage 5-Piece Drum Set fits into this category, and should be treated as such. Do not turn a blind eye to this trap. Other good cheap beginner drum sets have a hard time comparing after being matched up with the ddrum MB D Series Drum Set. This full-size trap has a nice chrome look, and it will not break the bank when you check this set out for purchase. 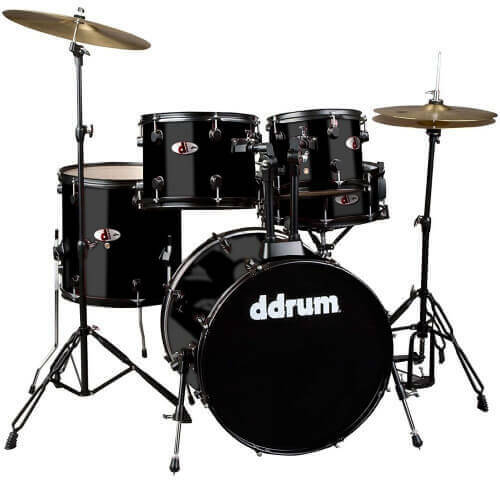 Included with the cost, the ddrum drum set has a 20-inch bass drum, a 14-inch snare, 3 toms, a cymbal, and a high-hat. The drum heads are easily tunable and stay that way throughout drumming. The shells are made from basswood, which is similar to the material that guitars are made from. Red and black are the color options. Try using this drum set for practice or in a venue setting, if you become that good down the road. As a valuable mid-range drum kit, this set will continue to help you grow and improve for many years to come. The quality of construction for the ddrum MB D Series Drum set is prime, but the heads and cymbals do not seem to be of the same standard. This is perfect for a beginner, but upgrades may need to take place to keep the tone of this drum set sounding great time after time. These days, cheap drum sets for kids are all across the market, but many are not really that good. However, you should not feel the same way with this next drum set. The best beginner drum set for kids is available to you, but you have to look carefully for the right one. The TKO 3-Piece Junior Drum Set includes a few quality pieces: a 16-inch bass drum, a 10-inch snare, one tom, and a cymbal made from brass. One specific thing that separates this set from a traditional 3-piece drum trap is the fact that the cymbal stand can be tilted and adjusted. This can make a hug difference for drummers who are not only looking for an adjustable height option, but also placements for the perfect cymbal position. Another TKO upgrade is the aesthetics of the drum set in general. The rims match the bass drum, and with many sets these days, this is not the case. 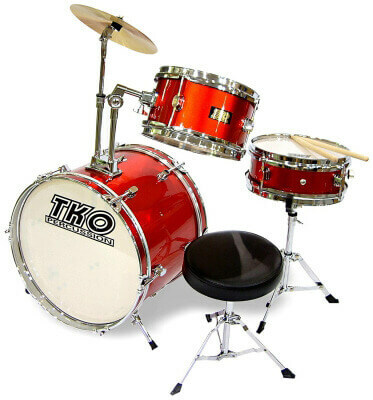 As a good beginner drum set, the TKO 3-Piece Junior Drum Set is a high-end basic junior set. Some look to this set as their first drum set, and then upgrade to a bigger trap or one with better quality. It plays as a best drum set for 8-year-old beginners. No matter if you are looking for the best drum kit for beginners or the best starter drum set for adults, this review has now given you the information to investigate what trap is best for you and your lifestyle as a beginner. All of the reviews were acoustic kits, but know that electronic sets might be up your alley as well. 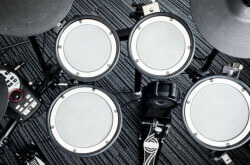 If need be, we do have a special guide to some of the best electronic drum sets for beginners to fill you in on this information, too. Know that whatever beginner drum set you do decide to go with, make sure that it fits your needs and no one else’s. You will be the one playing the drum set most often anyways. Good luck and have fun rocking out. Practice, practice, practice, and see what you could become. Greatness may be on the horizon.